This is a really good circuit to change-up the daily or weekly routine. You can do them in any order. Aim for at least twice a week. Include cardio such as the HIIT on treadmill, bicycle, or elliptical machine for no less than 25 minutes. 1–Lunge Shoulder Press–you can alternate legs or one leg at a time. Make sure to aim for 15 at least. 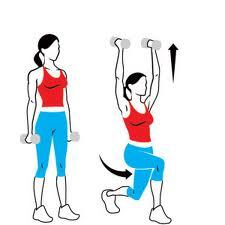 2–Dead LIft Back Row–A set would be steps A to C, then step D would be come back up to position A. Aim for 15. 3–Side Bends–aim for at least 15 on each side. 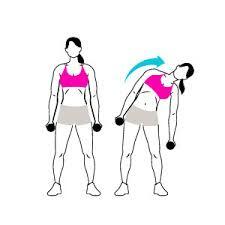 You can choose to hold one dumbell per side with other hand on your head as well.